A little while ago I found out about NeoLemmix, the editor is really fun to use, so I tried making a few levels. I think the levels might only work on NeoLemmix, I'm not sure if this would be better in the NeoLemmix board, sorry if I posted this in the wrong place. The download for this pack is in the attachment of this post, I saved them as individual level files (sorry, I couldn't figure out how to merge them all into one file). Hope you guys like them! EDIT: Also I don't know if neolemmix can record replays (I've mostly spent time playing with Lemmini), if it does, please post them, I'd be interested to see your solutions! EDIT: Version 2 Released! Contains 1 new level, and some edits to the existing levels. Welcome to the forum, JW! Yep, these levels do indeed work on NeoLemmix, and you posted in the right place; the NeoLemmix board is meant more for discussing NeoLemmix features such as the player and the editor, the graphic set tool, custom NeoLemmix tilesets, and reporting bugs and suggestions. I've played all four of your levels and I'd say two of them are Tricky difficulty, while the other two could be in early-Taxing. Measure Once, Cut Twice - interesting level in that you have a 2-minute time limit. I'm not sure if my solution is intended, but this level looks like it could have multiple solutions. One Way, Another Way - that level reminds me of Mayhem 6 "One Way Or Another" mainly because they're both dirt levels and the titles of both are very similar. It is mostly a builder level, but I like the way you have to save the left side - build a safe bridge using a lemming from the right side so the left-side lemmings won't fall into the abyss. Watch that first step! 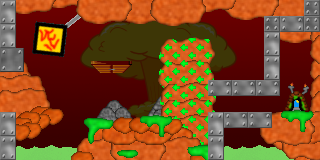 - this level is interesting because it has no diggers, and uses zig-zag miners to go down the dirt instead. The Dynamic Duo - now this one is the hardest of the four, as it has a 1-minute time limit and a small skillset. I thought the solution was very clever in the end, though I'm only left with one miner and one digger. Best one of the four! Attached are all of my replays! To put all the levels in one pack, all you need to use is the Flexi Toolkit. If you'd like, you can also submit your levels to the NeoLemmix Community Pack. The NeoLemmix Community Pack is in need of some easy levels, and your levels could work for that. Have level designer's block right now? Have some of my incomplete levels for LOTS of ideas! I thought just by considering the difficulty per Wafflem's post that I might do these levels as well. I'm pleased to say that I've solved them all, complete with alternative solutions in comparison to Wafflem's. I ended up saving more on 'Watch that first step' than Wafflem did. I cheated a bit on 'The Dynamic Duo' first time round by slowing the second lemming down, but I did do it properly eventually. I wonder if that level is actually eligible under the current Level Design Contest rules? Anyway, here are my replays. Nice levels. I found all of them to be pretty fun and not very hard. On "One Way, Another Way" it's not actually necessary to use a lemming from one side to help the other, it's possible to do the two sides entirely separately. Up to you whether that's okay or you want to enforce a tighter solution. The only criticism I'd make is that, on "Measure Once, Cut Twice", the hatches are right up against a similarly coloured patch of terrain, and it was annoying having to work out or guess exactly where the terrain ended. I didn't save any replays, but if you like, I can do them again and try to make sure I do the same solutions I saved 76/80 on "Watch that first step", 100% on the others. I redid the levels and saved replays All basically the same solutions as I used the first time, except this time with a bit more care I saved 78/80 on "Watch that first step", which is probably the maximum. Also I would cut the timer from at least the marble and the 2 dirt levels as it contributes nothing to the overall solution. The levels aren't too hard, but much fun! Measure Once, Cut Twice: The easiest of the four levels. I would prefer to have the screen start at the right end of the level, so that the exit is visible right from the start. Otherwise a very good level. One Way, Another Way: I am not too happy with all the building required to solve the level, but given the various places to use terrain removal skills the level was still fun. Watch that first step! : Interesting level. I am only missing a bit more decoration like grass on the earth, ... Currently the level looks a bit bare. Your replay is really close to my solution actually, I was able to save some builders but my run was slower. It was actually inspired by "One Way or Another", that's one of my favorite levels! It's intended to be a mix of Mayhem 1 (Steel works) and Mayhem 6 (One Way or Another); in fact some of the tricks on this level I used for my solution for Mayhem 6. I probably should have upped the number of lemmings you needed to save, maybe this would be more interesting if you would have to start out with a low bridge so you could save the lemmings coming out of the right door sooner? The NeoLemmix Community Pack is in need of some easy levels, and your levels could work for that. Also how did you slow down the second lemming? Was it by repeatedly using bashers in thin air? Good point (I probably missed that because I usually dug farther to the left), I'll avoid doing that from now on. The "Watch that First Step" playthrough was close to what I was intending, at one point I considered setting it up so that the players would be forced to build a lower bridge to save the lemmings from the right door sooner, but I wasn't sure if it was a good idea so I padded out the lemmings count a bit and added more skills and time. Very good point, now that you mention it, I'm not sure why I shifted the camera over. Yeah, I went overboard a little, I sort of wanted a longer version of "One Way or Another", I think next time I'll incorporate more of "Watch out, There's Traps About"(Taxing 2) instead of doing something that requires so many builders. Nope, that solution wasn't intended, whoops! I'll have to think of a way to prevent that. Exactly like Nepster's solution. By digging four strokes before bashing with the other lemming. To prevent that problem from reoccuring, I suggest that you add some steel on top of that starting platform. New level: "Journey Through The Depths"
This level is quite long, what do you guys think? In regards to that segment near the start with the one-way arrows (image attached for clarity), you'll have a much tidier-looking result if you change the piece at the end of the bar (the one with a purple box around it in the image) to have the "One Way" flag turned off. If you prefer, in the NeoLemmix Editor's options there's an option to turn this off by default for newly-placed pieces. The reason such an option exists is because some people were confused as to why one-way arrows appeared to be not working when the default was to have the option off. Since no one directly answered this yet: To save a replay file, the default key is "U" (you can reconfigure this). You can do this at any time during gameplay, or on the postview screen. There's also an option in NeoLemmix's settings to automatically save replays upon successfully completing a level. You still need to place them, but turning this flag off makes the individual terrain piece "immune" to one way arrows. So by doing this, you can create parts where non-one-way terrain overlaps one-way terrain. Notice how the rough terrain at the bottom is not one-way, even in the parts where it overlaps the terrain that is one-way. This is because the stuff at the bottom has the one-way flag off, but the stuff higher up has it on. Then, the one-way arrow object is placed over the whole thing. Thanks, I fixed the arrows. Also, through that same dialog I figured out how to use the flip / rotate flags.